Here you will find educational resources, including handouts, worksheets, lesson plans, websites, videos, powerpoints and more. "If we teach children everything we know, their knowledge is limited to ours. If we teach children to think, their knowledge is limitless." - Michael Baker, The Critical Thinking Co.
Critical thinking has become a buzzword in education. In the past, the emphasis in classrooms has been on teaching information and content — the times tables or the systems of the human body, for example. In recent years, however, there's been a shift toward teaching critical thinking, a skill that elevates thinking beyond memorization into the realm of analysis and logic. Put another way, critical thinking is about knowing how to think, not what to think (Scholastic.com). Truth: to separate what is true from what is false, or partially true, or incomplete, or slanted, or based on false premises, or assumed to be true because "everyone says so." Context: to consider the context and history of issues, problems, or situations. Assumptions: to understand the assumptions and purposes behind information or situations. Alternatives: to create ways of approaching problems, issues, and situations that address the real, rather than assumed or imagined, factors that underlie or directly cause them -- even when those factors turn out to be different from what you expected. The purpose of critical thinking is to achieve understanding, evaluate view points, and solve problems. Since all three areas involve the asking of questions, we can say that critical thinking is the questioning or inquiry we engage in when we seek to understand, evaluate, or resolve. Critical thinkers distinguish between fact and opinion; ask questions; make detailed observations; uncover assumptions and define their terms; and make assertions based on sound logic and solid evidence. Bloom identified six levels within the cognitive domain, from the simple recall or recognition of facts, as the lowest level, through increasingly more complex and abstract mental levels, to the highest order which is classified as evaluation. A description of the six levels as well as verb examples that represent intellectual activity are listed here. 1. Knowledge: remembering of previously learned material; recall (facts or whole theories); bringing to mind. 3. Application: ability to use learned material in a new situation; apply rules, laws, methods, theories. 4. Analysis: breaking down into parts; understanding organization, clarifying, concluding. 5. Synthesis: ability to put parts together to form a new whole; unique communication; create abstract relations. plan, prepare, propose, set up, write. 6. Evaluation: ability to judge value for purpose; base on criteria; support judgment with reason. Three techniques to improve critical thinking is by encouraging students to ask good questions, practice good thinking, and find answers using resources. You can create a small trophy and certificate for students who exhibit each of these positive critical thinking behaviours. These awards may be used in all subject areas and at anytime. For example, when a student asks a “Good Question”, the trophy goes on the student's desk/table for the day, or until another student gets it. You can even think of giving the student a paper certificate to be taken home. subject, concepts, or ideas under study. 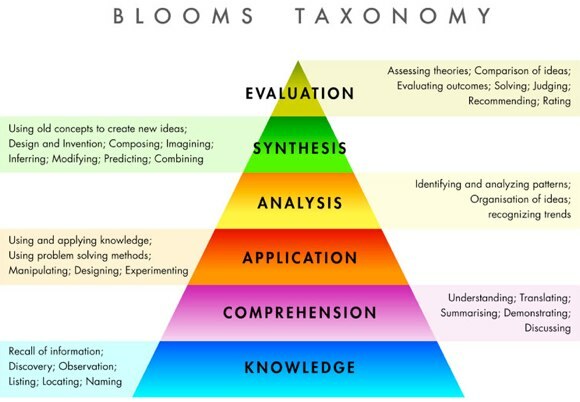 Generally, these questions are in the higher areas of Bloom’s Taxonomy; application (in the lower grades), analysis, synthesis, or evaluation. A “Good Question” may also show creativity. processes; analysis, synthesis, or evaluation. “Good thinking” may also involve solving a multi-step problem or coming up with an original idea or creative way to solve a problem. Of course, the teacher must challenge the students with questions that require higher order reasoning. The “I Found the Answer” award is given when a student has taken the initiative to look for and find an answer using a resource other than the text. This award will motivate students to find answers, rather than simply accepting “I Don't Know” as the answer. Students through application and practice will learn to use the dictionary, directory, encyclopaedia, index, glossary, maps, and the internet. Also, students should learn to ask people for answers. The best questions for research come out of daily classroom lessons and discussions in all subject areas. The teacher may also pose a “Question of the Day” to be researched. competent and comfortable in asking higher order questions, accepting more than one possible answer to a question, and practice not answering all student questions. Here adequate preparation and homework by the teacher is also very essential. their knowledge and skills while interacting in a small group. Most games involve planning, observation, logic and reasoning, calculations of chance, observing, using information, and creating and testing possible solutions. All of these “game skills” are components of critical thinking. Puzzles come in a wide variety of types from purely academic, which rely on knowledge or reasoning skills, to those which require acute observation, such as a jigsaw puzzle. No matter what the puzzle, the one commonality of all puzzles is they require critical thinking. Why jigsaw puzzles? In order to complete a jigsaw puzzle students must observe and compare size, shape, colour, and patterns; use trial and error to complete the task; and develop visual memory. Students experience working together towards a common goal, and participate in an activity that requires days or weeks to complete. SCAMPER is an excellent classroom activity which encourages students to think creatively. In this activity the student looks at an object and develops original ideas about the object and different uses of the object. SCAMPER is an acronym which helps direct students in this process. Scamper may be used as an independent, small group, or whole class activity. Students must be allowed to brainstorm ideas, making it clear that all ideas must be accepted. You can have the students work independently for 5 - 7 minutes, and then share their ideas with the class. Teachers may use small groups and develop a scoring system, giving a point for each idea that no other group has written. A simple activity that promotes critical thinking and creativity is listing two words and asking “What do they have in common?” While students may easily see differences among items, finding similarities will be much more challenging. This activity also promotes oral communication and explaining your answer. This may be done individually, with a partner, small groups, or even as a whole class brainstorming session. This activity can be part of your students’ first assignments as they come in the morning. Students can be asked to write an answer and then you can discuss their responses as a whole class. requiring students to think about items and classify items into categories. The teacher gives a category, and selects a volunteer for the first word. Then each next word must start with the ending letter of the preceding word. To speed the game along, change the category once either group is unable to quickly answer. Words Chains may be played in a variety of ways: one vs. one, small group vs. small group, half of class vs. half of class, or whole group. Words Chains encourages creativity as students try to connect words they know into a classification. You can use Word Chains as short filler when the class is waiting in line and as a whole group thinking activity. different ways. Introducing this skill to students will improve their reading and writing. When discussing word meanings the concepts of literal and figurative meanings must be taught. Word A Day - Put a new word on the board each morning. Allow students time to think about or look up the word. Discuss later in the day. Spelling or Vocabulary Lists - Look at the list (word) and ask students what words could have more than one meaning. New Words - As new words are encountered in class, list them on the blackboard. When you have that extra minute ask students if they remember the meanings or can use them in a sentence. Keep this ongoing list in a corner of the blackboard. Do not erase the words daily. Erase the “old” words when the list becomes more than 5 - 7 words. As the “old” words come down you may add them to a Word Wall, a writing bulletin board, or make a small card for each and put them in a box for future use. creativity. Students must create their own meanings for common acronyms. Acronyms are words made up of the initial letters of its meaning, such as SCUBA, self-contained underwater breathing apparatus and SNAFU, situation normal all fouled up. Acronyms may be pronounced letter by letter, such as CPR. Initialism is the term for an abbreviation pronounced as the names of the individual letters. These abbreviations are everywhere and are part of our everyday life. They are businesses (TTL, IBM, TCS), government agencies (NASA, DRDO, ISRO), television networks (BBC, CNN, ESPN), organizations (NATO, UN, SAARC), items (BMW, DVD, VCR), and in cricket (LBW). 35 Dimensions of Critical Thought - a breakdown of critical thinking into 35 aspects/instructional strategies. Google-Proof Questions are questions that can not be directly answered via Google (or any other search engine) because it requires, analysis, interpretation, and investigation.